That’s not happening—at least not yet. 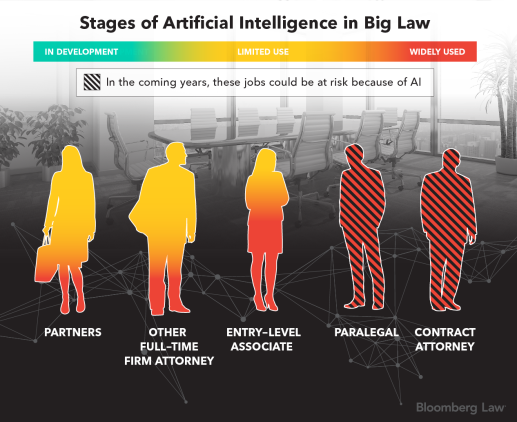 But artificial intelligence has already arrived in Big Law, changing the way many attorneys and administrators work and increasing the worry about potential job losses. Major law firms are preparing to incorporate AI at a speedier pace than ever before in 2019, as the anticipated industrialization of legal services picks up steam. Client pressures have been mounting on law firms—often slow technology adopters—to address concerns that old tech is keeping bills unnecessarily high. Clients are demanding that firms use AI-infused tools to speed work, lower costs, and provide better information. Firms have been using a range of AI-driven legal technologies that allow them to automate formerly labor-intensive efforts like document storage and review, and contract analysis. Efforts sped up in 2018. In October, a dozen leading firms—including Latham & Watkins, Paul Weiss, and Skadden—joined a venture called Reynen Court, which seeks to create a type of app store for firms looking to deploy AI and other technologies. Newer programs influenced by AI and its less intuitive cousin, robotic process automation (RPA), are designed to allow firms to speed the way they write contracts; craft litigation strategies; bill clients; hire and fire employees; and scour for possible client conflicts. At the same time, law firm leaders contend AI is spurring job creation at least as much as dislocation because of the increased amounts of data firms are able to digest. They also say “robolawyers” will never be able to provide the high-level advice at which seasoned counselors excel. “Here’s what won’t be going away: sophisticated, face-to-face human interaction between client and lawyer,” said Tim House, U.S. senior partner for Allen & Overy. 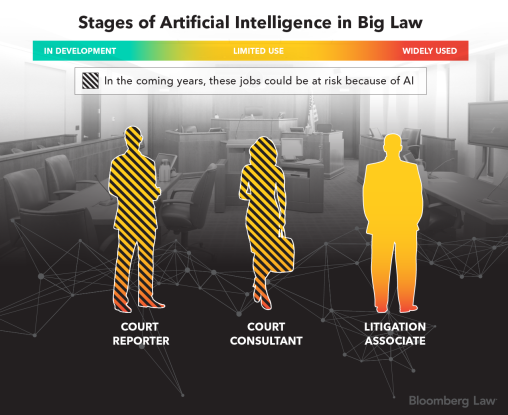 AI is more likely to endanger jobs in other areas of the firm, including paralegals and court consultants. Law firm managers have to think through a changing business model while they bring AI on board, data experts said. This account, and the following graphics, are based on interviews with 13 law firm administrators and data analysts, legal tech consultants, and AI-focused vendor executives. 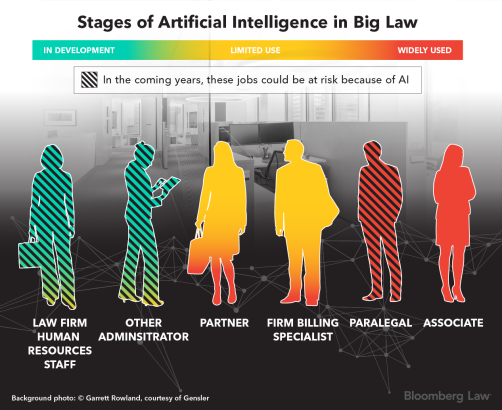 The graphics feature the types of AI-infused tech that are altering, and could possibly endanger, certain law firm positions. The days of contract lawyers and associates reviewing reams of paper documents in boardrooms are in decline as AI-driven software is on the rise. The adoption of AI into e-discovery platforms can speed reviews of what can be millions of documents, briefs and case files. In these types of document searches, far fewer contract attorneys at many firms are needed to handle the material, per case or matter, than was the case five years ago at most large firms. In one recent Orrick class action discovery review, 15 contract attorneys electronically sifted through emails and other online documents, firm data specialist attorneys said. That same month-long task would’ve necessitated 75 contract attorneys seven years ago, they said. Yet the Orrick lawyers pointed out, as did several others contacted for this story, that their firm is still using roughly the same number of contract attorneys because the amount of e-data is fast-growing, and AI efficiencies have allowed the firm to take on more work. Huge paper document dumps also have been a standard feature of various types of contract analytics. Now, AI-infused software that uses machine learning can sift through documents and learn as it searches for specific language that could be useful in due diligence reviews, for example, in big contract-heavy corporate acquisitions. AI software in development that employs natural language processing could change how firms prepare for big court cases. Some programs can sift through millions of court decisions to find advantageous trends. Others could transform the jury selection process, through the use of predictive analytics that give more data to attorneys anxious to understand how juries and judges might act. Yet other programs are on tap that could speed and improve court reporter transcriptions. Top litigators, in fact, are currently testing juror analytics programs in the hopes that gaining more data about prospective jurors—including detailed social media profiles—will give attorneys more of a sense of how they’ll act if selected. “Now, today, there is tech that allows you to get information about jurors in real time,” allowing for a much broader profile of each person, said Kent Goss, a partner and litigator for Crowell & Moring. He said Crowell has been pitched by multiple vendors and selected a few programs to try. Goss said he plans to test the systems on mock juries he’ll be convening in advance of three big upcoming trials and by next year he thinks Crowell should be ready to use the program on live jury pools. As more firms adopt these programs, and as they become more sophisticated, Goss said it’s likely fewer juror consultants will be needed. Basic law firm human resources functions like onboarding and termination could be automated in the future. AI systems also could impact the in-house firm specialists who handle client conflict checks and risk management. Billing clients is a vital but often time-consuming task for attorneys, who typically have managed their data manually by filling out spreadsheets or through a word processor. Yet at the urging of clients, the roles of lawyers and billing specialists are changing as e-billing takes root at more firms. AI billing programs better track time, ensure that attorneys adhere to client guidelines, and analyze what type of work is getting done. Paralegals, and to a lesser extent law firm associates, have long been tasked with nuts-and-bolts legal research, which used to involve wading through dusty, heavy law books, and more recently searching electronic legal research platforms. AI-enabled programs have already made these manual, human tasks scarcer.